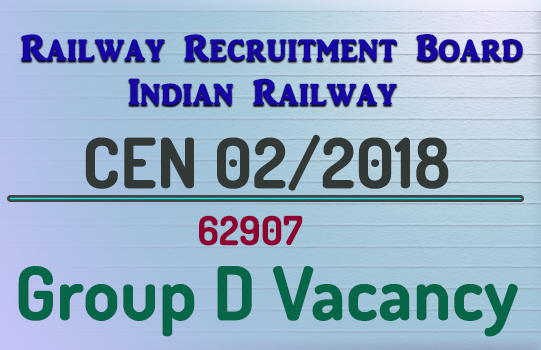 RRB Group D Recruitment 2018: The Online Application for the Indian Railway Group D Notification CEN 02/2018 has been stated from 10.02.2018 rrbonlinereg.in. Eligible Candidates can apply for Railway Group D Vacancy 2018 by login to the participating Railway Recruitment Board (RRB). The website of Railway Recruitment Board can be accessed from www.indianrailways.gov.in. The details regarding Railway group d educational qualification, RRB group d post name, Railway group d post name list, Railway group d syllabus, Exam pattern and age limit for RRB Group D Recruitment 2018 have been described below as per the RRB CEN 02/2018 Notification. A Centralised Employment Notice (CEN) No.02/2018 has been published by the Railway Recruitment Board, Government of India (Ministry of Railways). The purpose of this notification is to recruit 62907 Group D various posts. The RRB has invited online applications from eligible candidates for the recruitment of Group D posts in Level 1 of 7th CPC pay Matrix for the vacancies units of Indian Railways. This is a golden chance to grab a Government Jobin the Indian Railway. The said vacancy will be completed through sixteen RRB regional boards such as RRB Ahmedabad, Ajmer, Allahabad, Bangalore, Bhopal, Bhubaneswar, Bilaspur, Chandigarh, Chennai, Gorakhpur, Guwahati, Kolkata, RRB Mumbai, Patna, Ranchi and RRB Secunderabad. The RRB wise Group D post details have been given in below table. If the candidates have passed class 10th and ITI from any trade can submit their form through concerned RRB regional website or visit rrbonlinereg.in. Pay Scale: Level 01 of 7th CPC Pay Matrix with initial pay of ₹18000/- plus other allowances admissible at that time. Last Date of Online Application: 12.03.2018 up to 23.59 Hrs. Date of Computer Based Test (CBT): April and May 2018 (Tentative). Candidates going to submit their application against the RRB Group D Recruitment 2018, must read the eligibility criteria in the official Notification No. CEN 02/2018 which is available on each participating RRB. Candidates should have the Educational/Technical qualifications indicated against the notified posts in the CEN from recognized Board/NCVT/SCVT as on the closing date for submission of the ONLINE application. According to the notification, the following minimum educational qualification should be required for Railway group d vacancy 2018.
e. National Apprenticeship Certificate (NAC) granted by NCVT. Age of candidate must be minimum 18 years and not exceeding 31 years as on 01.07.2018. Relaxation in upper age limit for the candidate belongings to reserved categories will be applicable as per Government norms. Category wise age relaxation in Railway group d vacancy 2018. Note: Candidates must read Annexure-A (given in official Advt.) for the prescribed qualification, medical standard against each of the posts. Candidates who are willing to submit their application must download the detailed advertisement (CEN 2/2018) from the any of the RRB's website. Before applying for the post against RRB Recruitment 2018 for Group D Posts, candidates should satisfy themselves that they fulfill all the eligibility norms including age, educational qualification and medical standard(s). Candidates should ensure that they have requisite qualifications from recognized Board/Institute as on the date of Closure for submission of the application for this CEN 02/2018. Visit the RRB official website for which you wish to apply. Search for the 'CEN 02/2018 Notification'. A new website will open <rrb name>.rrbonlinereg.in. Now Click on 'New Registration' and selection your Region / Railway Zone. Step 1: During the first-time registration process, candidates should enter their basic details like Name, DOB, Aadhaar details, Father's Name, Mother's Name, Matriculation / ITI/ NAC Roll Number & year of passing, Mobile number and Email ID then complete the next step. Step 4: Payment of Application fee. Step 5: Post Preference & Qualification and other details. Step 6: Upload of Photo & Document. Once all the stages are complete, verify the all submitted information then finally submit your application by clicking on "Submit'. Choose RRB Website to submit Online Application @ https://rrbonlinereg.in/rrb-apply.html or hhtps://rrbonlinereg.com/rrb-apply.html. Rs.500/- for all candidates except reserved categories as mentioned above. Mode of Payment: The prescribed application fee can be paid either through Online or Offline mode. By Online: Applicants required to pay the fee through Online by using internet banking or debit/ credit cards up to 12-03-2018 till 22.00 Hrs. By Off-Line: You can pay the fee through Offline by using SBI Bank Challan or Post Office Challan. The application fee through SBI Bank Challan can be deposited in any branch of SBI 12-03-2018 at 13.00. Post Office Challan Payment mode will be closed on 10-03-2018 at 13.00 Hrs at any branch of computerized Post Office.